There are numerous benefits to a military career, but none so easily recognizable as the pension you receive at the end of it. The primary measure of the pension’s value is obvious – as a retirement asset the pension provides a stable and secure source of inflation-adjusted income for life. While that, by itself, is a tremendous benefit, we believe a military pension also provides secondary value to the military retiree – the ability to safely take on additional volatility (usually called risk) in a retirement portfolio by aligning your asset allocation more aggressively. Portfolios with a higher ratio of stocks to bonds are considered to be more aggressively allocated than portfolios with lower ratios of stocks to bonds. Vanguard’s portfolio allocation models consider a 60%/40% split between stocks and bonds to be ‘balanced’. A portfolio split 80/20 is considered to be allocated for ‘growth’. 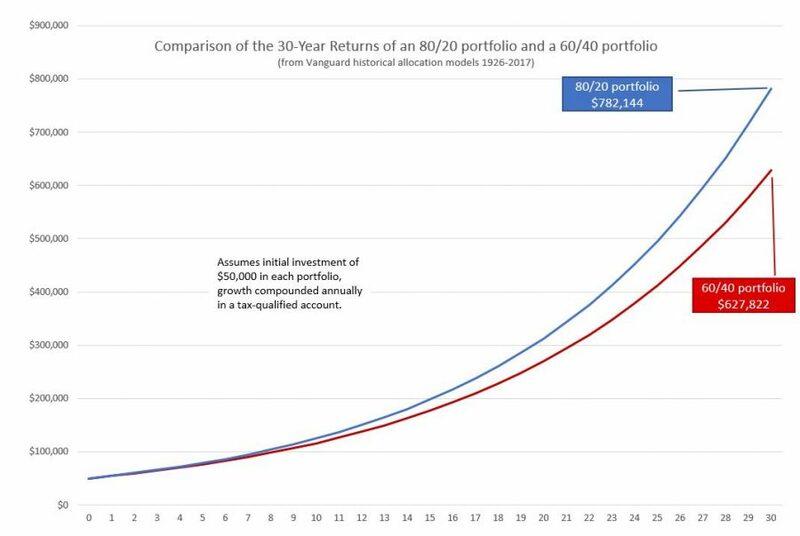 The chart below shows a 30 year comparison of the expected results of investing $50,000 into both a 60/40 portfolio and an 80/20 portfolio. While the difference in returns looks relatively small on an annual basis – 8.8% vs 9.6% – when compounded annually the net results are striking. The 80/20 portfolio has nearly 25% greater value at the end of thirty years. As always, additional investment returns require assuming additional risk. An 80/20 portfolio carries greater risk than a 60/40 portfolio. Our position is that ownership of a military pension can mitigate that additional risk, making it more reasonable to assume. Once common in the private sector, pensions have largely been replaced with self-managed 401K plans. While these plans are valuable and beneficial, their value usually pales in comparison to the guaranteed lifetime income of a military pension. A simplified method to compare the value of your pension to a 401K plan (or TSP) is to use the ‘rule of 25’. You multiply the annual value of your pension by 25. The result is the rough equivalent of a 401K portfolio required to support the same income stream as your pension. (It is based on the theory that one can withdraw 4% of a portfolio per year with only a very small risk of completely depleting the portfolio and going broke.) If your pension is $25,000 annually, then you multiply $25,000 by 25 and your pension is worth the same as a 401K portfolio of $625,000. While this rule of 25 is a fair measure of a military pension’s value, it is a measure made in a vacuum. It does not take into account the pensioner is also accumulating additional assets for retirement – probably in a 401K or TSP. When we consider the pension as one asset in a retirement portfolio – not the entire retirement portfolio – new possibilities arise. So if a military pension is bond-like, what is a good bond proxy for the pension? This is a subjective point, but I prefer the 30-year US Treasury bond. I could bore you with my reasons, but I won’t. The 30-year US Treasury bond provides a reasonable proxy for a military pension. There are others, and perhaps someday we can debate the merits of each, but for this article I am using the 30-year US Treasury (UST30). As of this writing the UST30 was yielding 3.2%. To convert a $25,000 pension into an equivalent 30-year Treasury bond yielding $25,000 of income each year, we divide the pension by 0.032. This makes a $25,000 pension worth $781,250 of 30-year US Treasury bonds – when the yield is 3.2%. 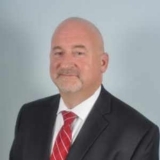 The question then becomes – if I own a fixed income asset equivalent to $781,250 of 30-year US Treasury bonds in my retirement portfolio, should I ever buy actual bonds for my retirement portfolio? Even if my goal was to have a 60/40 split between stocks and bonds in my portfolio, I’d need to accumulate $1,171,875 in stocks before I bought a single bond! This approach (considering 100% of your pension as a bond for retirement portfolio allocation purposes), while not entirely irrational is certainly quite aggressive. Whether you’re comfortable with that or not, the key consideration is whether it introduces higher risks without a proportionate increase in expected rewards. As an entering argument–and certainly for do-it-yourselfers–we tend to prefer a more moderate approach to using the value of the military pension to increase the aggressive allocation of a retirement portfolio. You should strongly consider the following limitations in putting together your allocation strategy. Only convert the portion of the pension covered by SBP (survivor benefit plan) to the UST30 proxy if anyone in addition to the retiree is relying on the pension income. The reasons for this are fairly straightforward. If two people are depending on that income, then only the portion guaranteed for both should be treated as the retirement asset. Full SBP coverage is 55%, and most retirees who take SBP take the full 55% coverage. If our example $25,000 pension was 55% insured by SBP, then only $13,750 should be converted to a bond proxy. This results in an equivalent UST30 of $429,688. If your pension is not insured by SBP and you have another person (spouse or dependent) relying on that income, then we recommend NOT using it as a bond proxy for your retirement portfolio. Were you to unexpectedly depart the planet, your legacy would be to leave behind no pension and a volatile portfolio with significantly high risk for the beneficiary. While the addition of life insurance with a death benefit could be used as a risk mitigation strategy, we do not recommend engaging in such a complex strategy without competent external advice. Limit this strategy to your need to assume additional risk to attain specific financial goals. Possessing the emotional and financial capacity to assume additional risk does not necessarily make the assumption of additional risk a sound financial strategy. Assuming additional risk in your retirement portfolio should only be done if it helps you achieve a defined, articulated, and measurable financial goal. “More” does not fall into this category. There is nothing wrong with wanting “more”, but while “more” can be articulated, it is not defined and is just barely measurable as a goal. Assuming additional risk just to have “more” is more like gambling than investing. Know the difference, and assume risk only to attain clearly defined and measurable goals. One of the rewards for the long hours, hard work, and personal sacrifices of a military career is your military pension. Not only can it provide you with a lifetime of stable, secure, inflation-protected income, but if used wisely, it can also enable you to make your other retirement assets work harder. Among the desired results, depending on the soundness of your plan, can be greater financial freedom and stability when you fully retire from the workforce and/or the ability to retire sooner. One last important warning–nothing in how you allocate your retirement portfolio can rescue you from unsustainable spending in retirement. So be very conservative–that is, if in doubt then guess high on purpose–about estimating what your spending will be like when you retire and every day is Saturday. If you have any questions or comments, or would like to further discuss either the role your military pension can play in structuring your retirement portfolio or your retirement plan in general, please feel free to contact us any time. We’d love to hear from you!